I have some friends who are quilters, and coupled with the fact that I’ve rather recently discovered that I enjoy the mystery book market, I thought I’d broaden my reading a bit and try this mystery in the “Quilts of Love” series. What I’ve learned is that there are a LOT of different kinds of mystery stories and I’m not enthusiastic about them all. 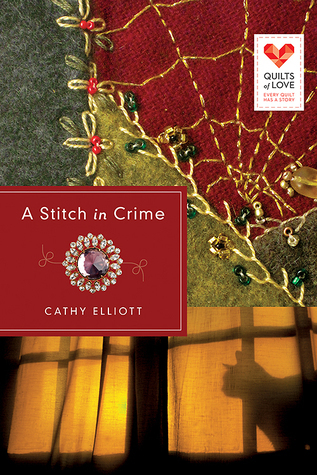 A Stitch in Crime is considered a ‘cozy mystery.’ A ‘cozy’ is a mystery with very little violence or blood. If it’s a murder, it happens ‘off-stage’ or out of view of the reader. The detective is usually an older woman, an amateur, in a smaller (intimate) community and the criminal is apprehended without much struggle. Think of the old television show Murder, She Wrote. I don’t think I am a fan of the cozy mystery. For me, a good story needs to have conflict — obstacles that the main character must challenge him/herself with overcoming. Mysteries typically provide great obstacles: who, how, where, when, why? If the set-up, or the impetus for the mystery, isn’t the crime, then what is there to attract the reader to the story? It would be the characters or the location. Here, I am definitely not the prime target market reader. I do recognize, however, that there is an audience out there for this sort of story (my wife would be one of them). With all this in mind, I try to look at this book from the perspective of someone who might want a cozy mystery, and even there I felt this book was lacking. Mostly this was just plain dull, with characters that didn’t appeal. What sounded interesting to me, was the theft of a valuable quilt piece (“When a renowned textile expert goes MIA and the famous Wentworth heritage quilt disappears, Larkindale’s reputation as a tourist haven is at risk.”), but this doesn’t happen until WELL into the book. Prior to this we have a LOT of set up and dialog that gets tedious and I never felt it was moving me toward something and so it seemed to get slower and slower. Main character, amateur sleuth Thea James, never comes across as capable of running a quilt show, much less solving a mystery. I was not amused by her, nor felt any empathy toward her. She was, in so many ways, like many of my neighbors. Nice people, all of them, but I’d be bored silly if I followed any of them for even a day. Looking for a good book? If cozy mysteries are your thing, you might enjoy this book, but the story and the characters are mostly bland and dull.